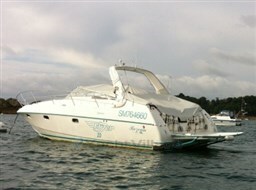 1989 Sealine 328 Sovereign fitted with twin Volvo Penta AQAD41 200hp engines. This well maintained example of this popular boat has had only one owner from new and benefits from, both engines overhauled, new upholstery throughout, new carpet, heating and a full cockpit canopy. Steema has a fully documented service history from new with the engines last serviced in September 2018. Available to view 7 days away by appointment only. Please call Lucy Tyler on 02393 510 434 or email (e-mail in contact data) for more information or to arrange a viewing. Steema has been in the same ownership from new. She spent 20 years of her life living in Menorca, where she was stored in a covered warehouse each winter and serviced before each season. She cruised back to the UK in 2016 after she had both her engines overhauled. She has a full service history from new with all bills and invoices filed. This boat has been well used but also meticulously maintained. Steema has a Thames boat safety certificate valid until 2022. 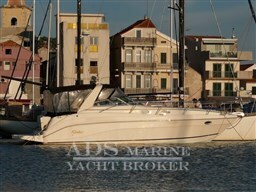 Dear Sirs, I have seen on YachtVillage your offer about Sealine 328 Sovereign - 1989 (code: 302424). I am interested in the offer and would like you to contact me. Thank you. 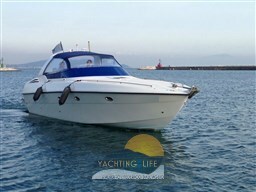 If you would like to find out more about this boat and any other boats of this type and range, Digibusiness Srl,the Company that manages YachtVillage, and ClipperMarine, the Company that exhibits the Boat, must necessarily acquire some simple details about you (name, surname, email address and, if needed, your telephone number). These details will be processed according to the purposes and means of the processing indicated in the privacy statement under the PRIVACY Section of this website, referred to herein.